Fill metal half of a Boston-style cocktail shaker with ice. Shake in a dash or two of bitters. Slowly pour contents back and forth between the two shaker halves 3-4 times until well-chilled. Bartender’s hints: While the classic Manhattan is served “straight up” in a martini glass, some people prefer to drink their Manhattan on the rocks in a lowball tumbler, so it’s a good idea to ask your guest if they have a preference. 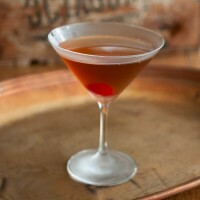 And there are those who enjoy a little splash of Maraschino cherry juice in theirs for a slightly sweeter libation.